When my son was 2 years old and first arrived at the sea, he said: “Mom, this pool is big!” It’s a great thing that little kids are not the only ones who can dream up a humongous pool—NASA engineers can too. 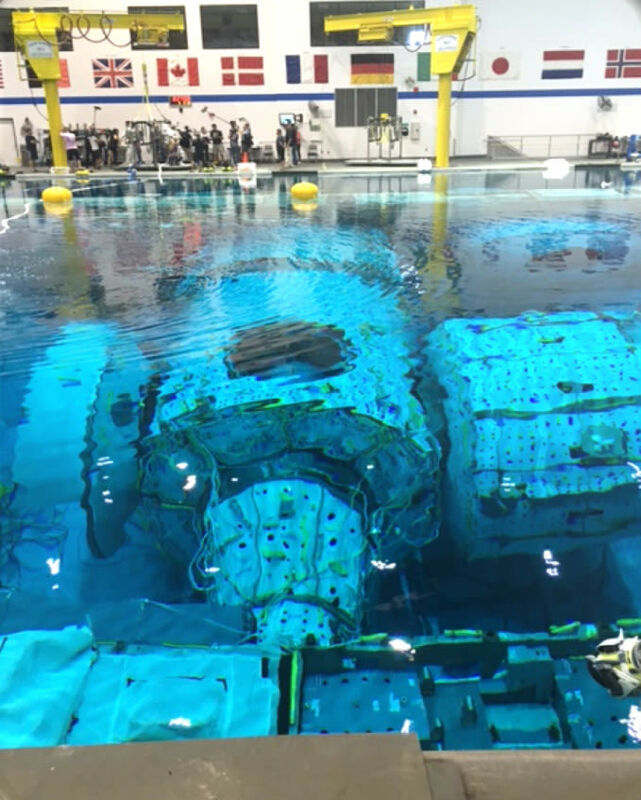 Twenty years ago, they created the largest indoor pool in the world, calling it an NBL or Neutral Buoyancy Lab, meant to simulate a zero gravity situation in space. The purpose of the NBL was to train astronauts for their space walks—you know, the times when they head outside to fix problems. Of course, to do this, they had to put a mock-up of the International Space Station inside that large mass of water. 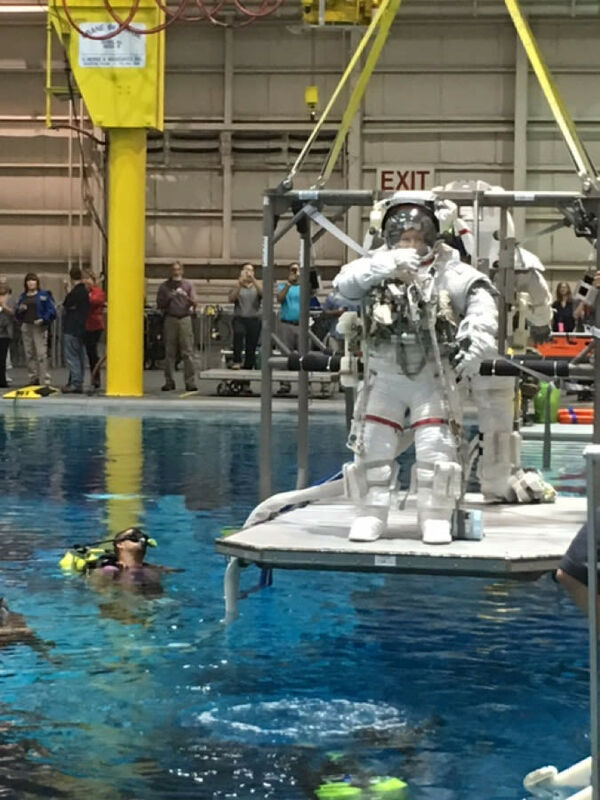 They also had to have teams of engineer-divers and a staff to support these amazing astronaut spacewalk training sessions in the water. This September, when I was invited to the NBL, my first thought was a football party (NFL, NBL...), but it ended up being one of the most special invitations ever. I was invited to NBL by a crew member of the ISS. 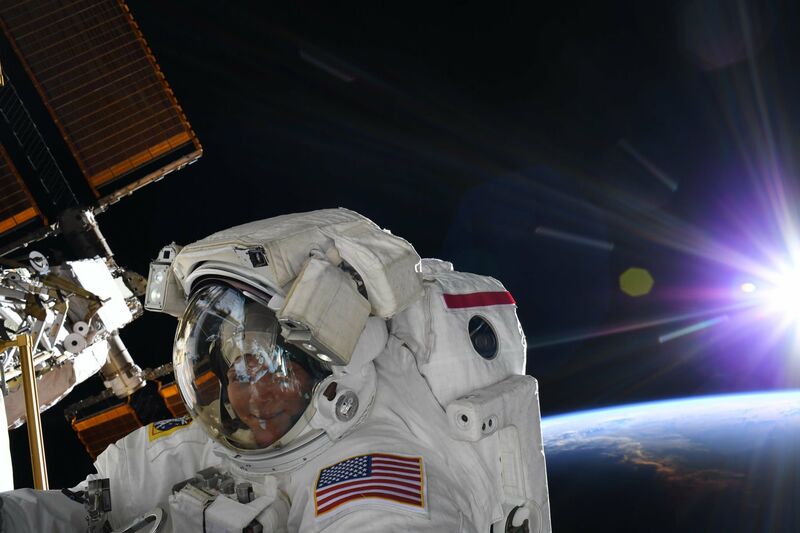 The International Space Station is just one of a plethora of abbreviations that NASA engineers throw around like hotcakes. I have visited NASA before, so I am aware of the fact that NASA people enjoy speaking their clan’s engineer language, and they speak it fast. They put on that enigmatic smile to go along with it as if though they are secretly telling you: Catch me if you can! If you want to really know what they are talking about, you would have to stop them every two minutes and ask for explanation of the abbreviation. So instead, you just nod and put on a “Oh yes!” face. My NASA visitor face is usually saying: I don’t really understand all of this but I am saying yes to this incredible human endeavor and it looks so cool that I can’t stop myself from smiling and nodding my head. 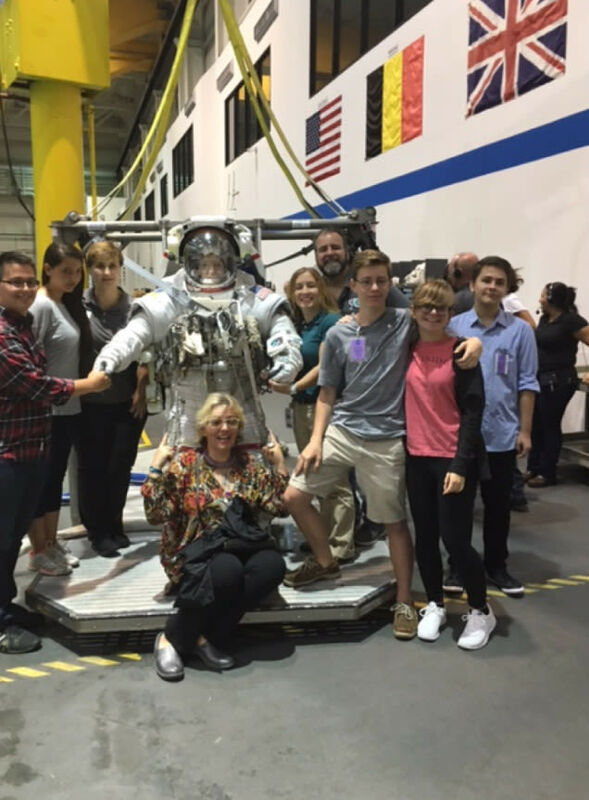 So this is how special of an invitation I had this September: Astronaut Peggy Whitson invited my whole family to watch one of her NBL space walk training sessions. Because Peggy would be dressed in the full astronaut suit, and she would have to be focused on her job—ISS repair training—she would not be able to talk to us, but she arranged for her colleague Ann McClain (whom Houstonia recently profiled in our New Women of NASA feature) to be our guide. 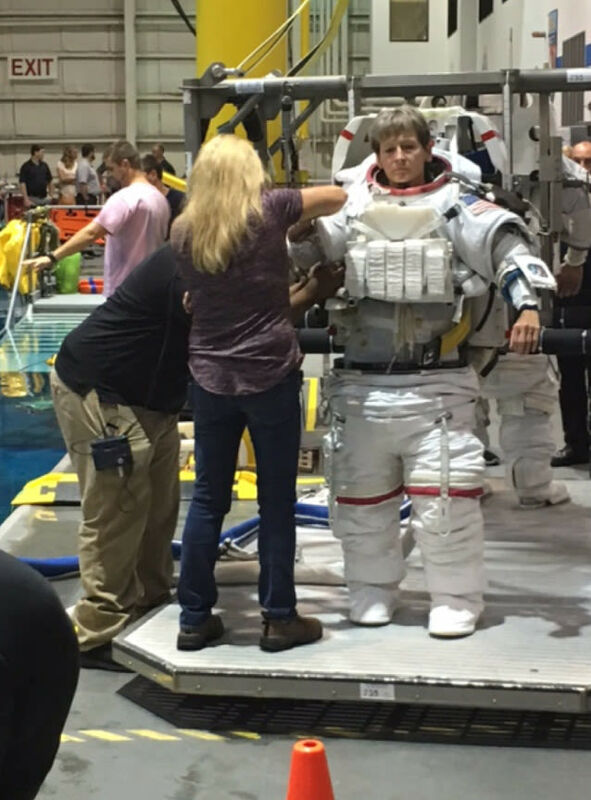 Astronaut Peggy Whitson's suit weighs close to 300 pounds. Ann looks like Peggy’s daughter, incredibly physically fit, and my head is nodding and my face is shining while I listen to her explain all these amazing things to us. We can feel and join in Ann’s deep reverence for Peggy, who is a superstar, a queen among astronauts, for she has flown many times, seen a thing or two, and fixed a few real problems on the ISS, I am sure. This is why there are crews of cameramen and producers following Peggy, preventing the rest of us tourists from taking good shots of it all… I can't help my curiosity so I ask one of the cameramen what channel they are filming for? My respect deepens at his response: National Geographic. After immigrating to America, I was surprised to find out that things that I considered as American national treasures, such as the beautiful Steinway Hall in New York, were unknown to so many Americans. However, I am absolutely certain that my fellow Americans would be just as excited and just as impressed as I was with the NBL, had they the chance to see it with their own eyes. I am also sure that New Yorkers would be jealous of us Houstonians for this, and I plan to brag about it on my next trip to the Big Apple. A quick family portrait with Peggy before she goes into the NBL. It does help that my super sweet husband Joe is a NASA engineer who trains astronauts for the ISS, because this is what got us all invited in the first place. What, you thought that I was the president of Croatia or something? Before entering the special grounds of the NBL, which looks quite inconspicuous at first, one of many such inconspicuous buildings at Johnson Space Center in Clear Lake, he simply told us to behave, not to embarrass him, and he mentioned that folks might be wearing Hawaiian shirts because it was Friday. As soon as we walked in, we spotted men wearing Hawaiian shirts, looking very happy. Our tour guide, astronaut Ann, was there to meet us. Joe’s first joke to her was, “Isn’t it buffet first? 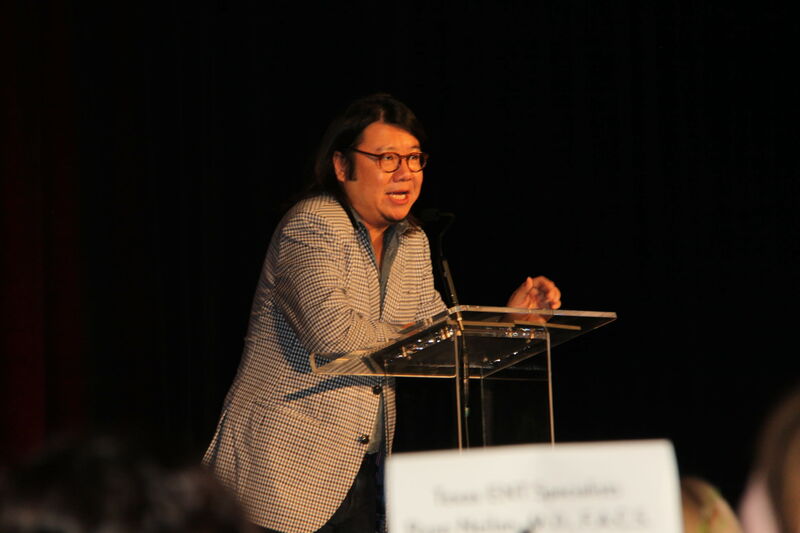 It said that in the email!” I am sure that Joe would have returned to his beloved state of New Jersey if he never stumbled into this job that he adores at NASA. Here he is, many years later, loving it just as much as in the beginning. Now it was time to finally enter the sacred pool, but before we did, Ann told us a few fascinating facts about the facility: The pool is 40 feet deep and it holds over 5 million gallons of water. There are three teams of safety, utility and camera divers there. And the astronaut suit that Peggy would be wearing weighs around 300 pounds. When we walked into the pool lab territory, our eyeballs popped. 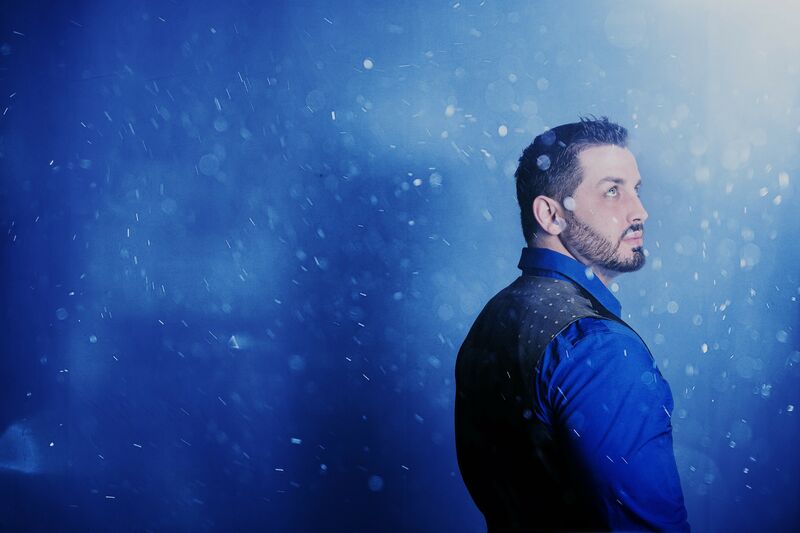 It is really difficult to describe this moment of amazement in just words. An onomatopoeia seems more suitable: Wooooooooow! It was a moment when you wanted to take a million pictures, because there is an enormous wave of visual info to take in: the incredible size of this pool, its intense blue color, then the whole ISS, as big as it really is, inside it, clear as day. It looks like a magical underwater city, one of Poseidon’s richest treasures. There are other “stage props” around, including diver mannequins and flags of countries whose great people participated in these training sessions. Ann started talking that engineer fast talk, explaining what is the training of today going to be about. It sounded something like this to me, the non-engineer, the fine arts type: “expect a practice run, voltage, launch, air rocket, air lock, like a coffin, reconfiguration, docking port, body pillow, MMR, o ho!" As usual, I nodded my head and smiled. I stopped her briefly to ask, "What is MMR?" The understanding I came to in my head after further explanation was that Peggy will have to fix problems on the ISS caused by micrometeorites, those dangerous little things that fly in space. Micrometeorites cause damage, and Peggy will fix it; that concept and that vision really stuck in my limited fine arts brain’s memory. Peggy, all dressed up in her astronaut suit, waved at us from above what looked like a queen’s balcony to me, and we waved back. I was distracted by a handsome guy in a cut-off t-shirt and tattooed arms who waved to me from the pool a little later, asking us if we would like to jump in. "Of course," says my daughter Maya, and she means it. The man in the pool is one of Peggy’s support engineer divers and he looks so deeply satisfied, like he has managed to get the coolest job in the universe. Peggy is now coming to a docking platform, getting ready to go in the pool. She is looking at us while being prepped and filmed by many cameramen. We get the chance to take a big family shot with her. This is our pic for the posterity. After this, Peggy slowly descends into the pool. Her descent was the most magnificent and most memorable visual of it all. NASA theater at its best! Our tour guide proceeded to answer our many questions, but her own little 3-year-old son asks the smartest ones. That cutest little future scientist-engineer! My joke with Ann is that I too applied for the job she now has, and that she beat me. She is an engineer and a helicopter pilot, a big advantage for her. 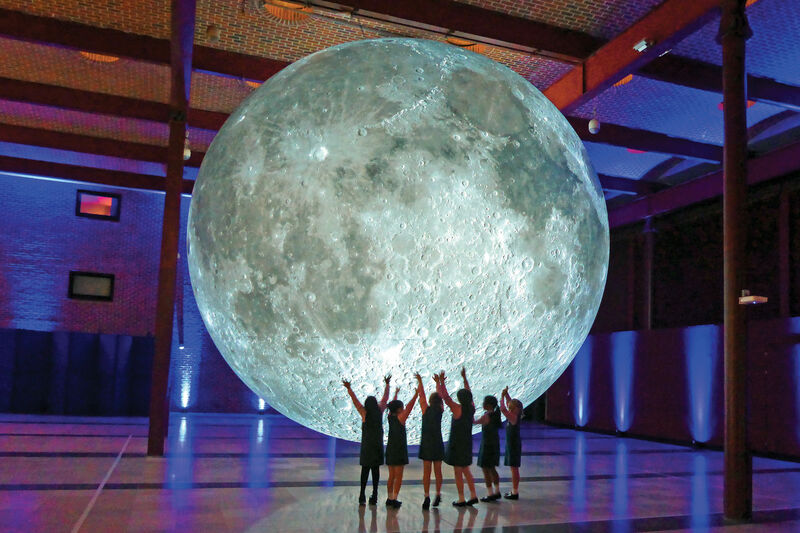 I am still looking for that rejection letter from NASA, the one that I am going to enlarge, frame and put on my wall in the central location of my house. Yes, it is true that I applied to be an astronaut candidate, all online, completely legit. The job title itself was fascinating enough without adding the other elements, like writing an essay about why you would want that job, etc. When I first met Peggy at a house party in Clear Lake, I asked her about my chances for the job. As far as I remember, she said that about 3,000 people apply and NASA takes three to six. Ann talks about Peggy like a yogi would talk about Buddha. Peggy is going to launch in November from Kazakhstan and be in space for six months total, alongside French astronaut Thomas Pesquet and Russian cosmonaut Oleg Novitskiy. She will be there during overlapping expeditions 50 and 51, which she is in charge of. As we left, I saluted her in my mind: All the best to our superstar astronaut and to all of her expeditions.